In 1877, Colonel James Armstrong moved to California and bought 600 acres of the densely forested area north of Guerneville. He built a saw mill and set about harvesting the timber, but quickly realized that the forest was not inexhaustible. In 1880 he set aside 440 acres as a nature preserve and botanical garden which would later become the Armstrong Redwoods State Natural Reserve. One hundred and thirty years later, Armstrong Woods has grown to encompass 805 acres, and is the largest old-growth redwood forest in Sonoma County. Specifically it is home to the regal coastal redwoods (Sequoia sempervirens), which can live to be over 2000 years old, and tower over 350 feet. 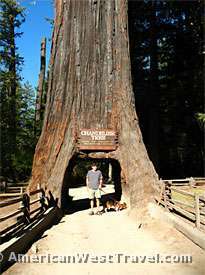 They are the world's tallest trees. The reserve is one of numerous state parklands (as well as Redwood National Park) in northern California protecting the few remaining stands of virgin (or old-growth) coastal redwoods (i.e., forest that has never been cut for timber). Second or later generation redwood forests would take many hundreds of years to reach the immense size that awes all who see them. The giant redwoods are a rarity to begin with, growing only in a narrow coastal strip in California, roughly from Monterey to the Oregon border. All of the state's redwood preserves stand as a reminder that before logging began in the nineteenth century this entire region was dominated by these amazing, ancient trees. It's hard to describe the feeling of standing beneath such a giant; of hearing the wind blowing in the tree tops hundreds of feet above. It is humbling to know that it was standing right there long before John Hancock signed the declaration of independence, before Columbus even arrived in the new world. It is hard not to be impressed by anything that exists in such a timeframe. 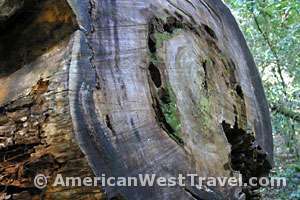 The oldest and tallest trees at Armstrong Woods (Colonel Armstrong Tree at 1400 years and the Parson Jones Tree at 310 feet, respectively) can be viewed on the easy, self-guided nature tour which follows a paved, well-maintained path through the valley. Also good for tree gazing are the various picnic areas, and a large outdoor amphitheater located in the center of the park. Adventurous souls can spend a day exploring the more challenging ridge trails, which range from two to nine miles in length. Be sure to bring plenty of water though, as the valley atmosphere can be misleading and temperatures in the upper hills can soar to over 100 degrees in the summertime. When conditions permit the park is also open to equestrians. Rides can be arranged through the Armstrong Woods Pack Station. To get to the park, head north from San Francisco on highway US-101. Leave the freeway at Rohnert Park and proceed west on California-116 to Guerneville. This becomes the Route-116 Sonoma County Scenic Byway at the town of Sebastopol. (There are many excellent opportunities for wine tasting in this area.) West of town, the road starts to wind sharply through dense second-generation redwood forests and eucalyptus groves. Be cautious driving through the dark, dense woods and then coming into open areas with very bright sunlight. This can be almost blinding during the afternoons. At the second traffic signal in Guerneville, turn north (right) on Armstrong Road, which dead-ends in the park a few miles north of town. The drive from San Francisco is about 75 miles and will take about an hour and a half, more during periods of heavy traffic. The quaint town of Guernevile and the smaller village of Monte Rio a few miles west offer numerous small shops, crafts, restaurants, wine tasting and a number of pretty inns and bed-and-breakfasts. If you have time, continue west on this pretty route a few more miles (of fairly easy driving) to Highway-1 on the coast. The Shoreline Highway going north almost immediately climbs on switchbacks to the top of the cliffs where there are spectacular views and vista points featuring the rugged coastline. A few miles north, the pretty coastal village of Jenner offers more shops and modest lodging. 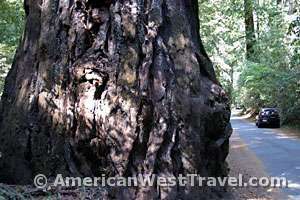 For more information check out the Armstrong Redwoods State Natural Reserve website. 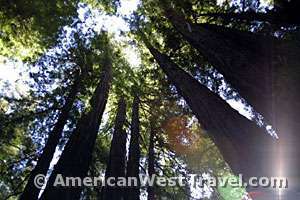 Below are additional photos of California redwoods. At left, the drive-through Chandelier Tree on private land near Leggett. 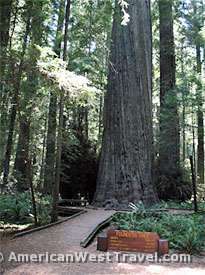 At right, the 346-foot tall Founders Tree in Humboldt Redwoods State Park.